Last week I participated in my first cash mob. 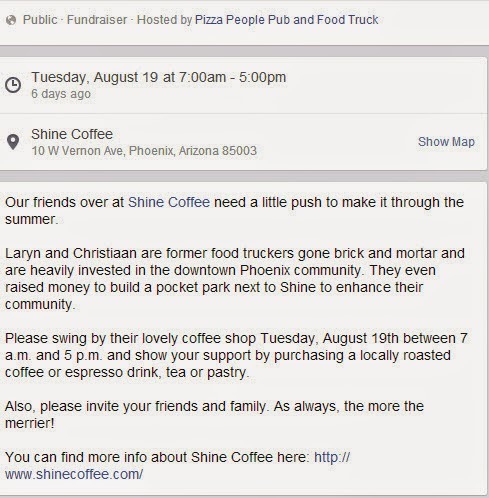 I received a Facebook invite for a cash mob benefiting Shine Coffee, a local coffee shop in central Phoenix. I made my way down Central Avenue on that rainy Tuesday to do my part. I traded my usual Starbucks drink for a chai latte and as the friendly owner took my order I remembered why it’s important to frequent local businesses. Her big smiled showed she was genuinely grateful for my business and made me feel welcome. I wished I could sip my drink at the table while the rain cleared up. But, alas, I had to get to work.